Wow! This is absolutely astonishing, brilliant, and breathtaking! Believe me, I’m not exaggerating. 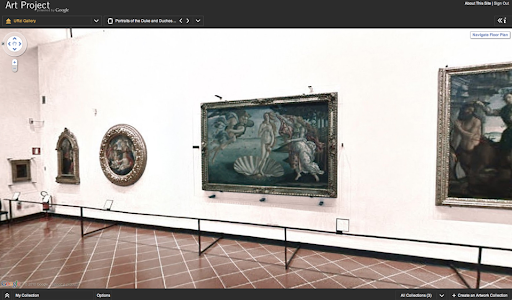 By using the same process as the Street View vans that trekked through cities and suburbs for Google Maps, Art Project gives people a first-hand look at 17 of the world’s most acclaimed art museums—including, among others, The Metropolitan Museum of Art in New York, The National Gallery in London, and the Uffizi Gallery in Florence—with a selection of super high-resolution images of famous works of art as well as more than a thousand other images, by more than 400 artists, at one’s fingertips. when a small group of us who were passionate about art got together to think about how we might use our technology to help museums make their art more accessible---not just to regular museum-goers or those fortunate to have great galleries at their doorstep, but to a whole new set of people who might otherwise never get to see the real thing up close. So what are you waiting for? Go there and enjoy! Great idea! Very good reproductions. I had a quick visit to London's National Gallery but one particular old master that I love doesn't seem to have been included. (Holbein's 'Anne of Cleves'). The Rijksmuseum has three that I particularly admire, and the reproductions are very good indeed. 'Rembrandt's self portrait at an early age' , Vermeer's superb 'Milkmaid' and his 'View of Houses in Delft. And the Whistlers in the Freer Gallery! Wonderful. Thanks for letting us know Rob. What to say? Well, you know, I have spoken Italian all my life... and I don’t regret that at all, but, then again, what is life without challenges--especially the ones you love? Admiring the hard work you put into your site and very informative insight you disclose here. It's awesome to discover a blog in a rare occasion that is not all the same outdated rehashed information. Wonderful job! I've bookmarked your site and I'm including your blog URL to my Google account now. Even more, I appreciate your site so much that I am interested to advertise my own site www.emt.co.il on yours. I will be glad if you contact me at: everythingrainbowhk (AT) gmail.com with your quarterly advertising prices. Thank you!